Must be made into a loving hat or scarf for someone who doesn't need next-to-skin soft. SO pretty!! Amundsen Sea. Hand dyed by Ilga of Edgewood Garden. 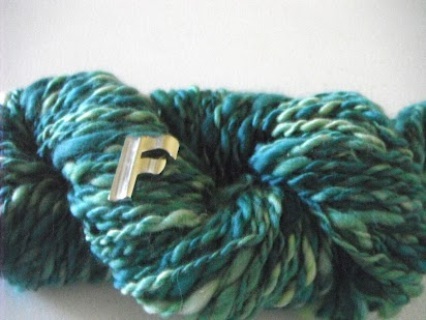 Hand spun into a thick and thin yarn. BFL wool (it is a sheep breed). 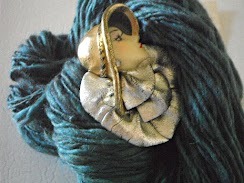 72 yards 4 oz 2ply spun extra bulky. You have got to see this to believe the colours and softness. It must be made into something worn lovingly around the neck! Handwash cold water. It is a real joy to spin anything from Edgewood Garden! 2 ply spun mostly chunky but the occasional thick part snuck through my fingers just because the fiber was speaking to me. 114 yards 4.2 ounces 6-8 wraps per inch. Must be handwashed in cold water. 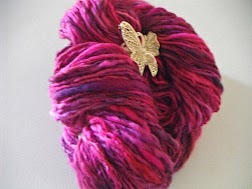 A true feast for the senses, this 2 ply handspun is 70 yards of pure pleasure!! 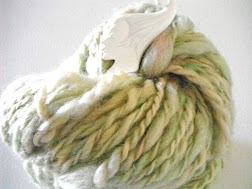 Grace of Larkspur Funny Farm put so much love into this batt it was a joy to spin! Next-to-skin soft, spun as thin as I could with 6-8 wpi, it contains merino & silk in so many shades of teal, you'll think your eyes were playing tricks!